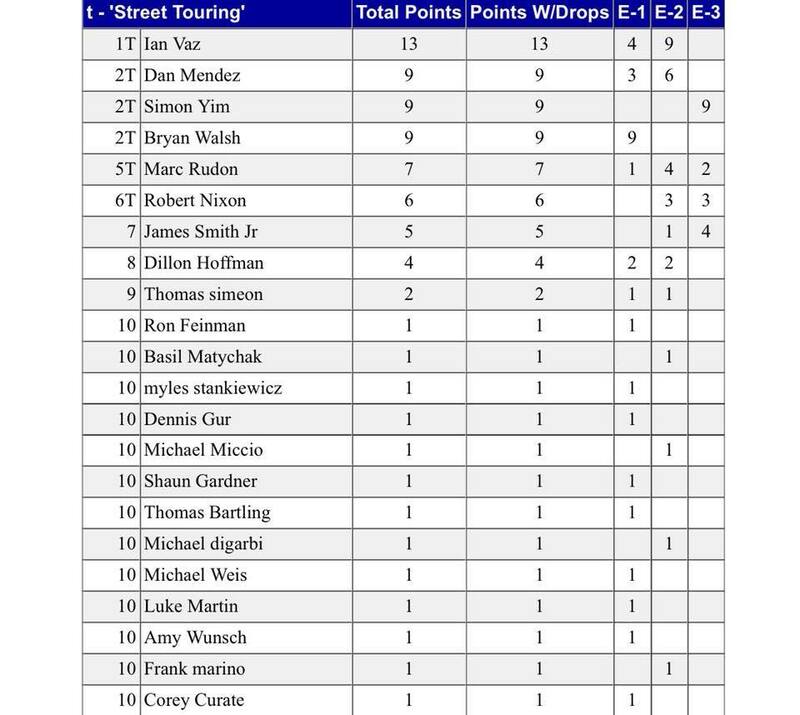 OK sports fans, before we get to the next event on June 10th, let's take a look at the standings in the Street Touring Class after the first three events of the season. 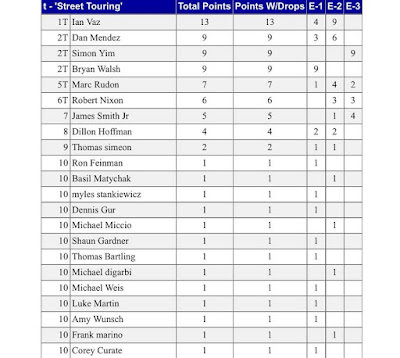 Keep in mind that drivers score at each event and receive nine big points for victory, six for 2nd (AKA: first loser! ), four points for 3rd, three points for 4th, two points for 5th, and all others get one little point just for playing our game! NMS is sitting in 6th place, and at this point in the season we've finished fourth at our two events, and hope to move up in the future. Looking at the cars involved, we see the most are from Japan (Miata, Subarus), then from Germany with the BMWs and VWs, some from the USA (hello Mustang and Ford Fiesta/Focus STs), and one from Italy. We'll have to give the Gold medal for autocross car building to Japan, Silver to Germany, and Bronze to the good old USA, but will point out who won WWII. Spoiler Alert of the Day! Looking across the field of 22 drivers, we see only one driver, Marc Rudon has competed at all three events, and six others have run at two events. One thing we've learned is that you have to play the game if you want to win, so it's important to compete as often as possible, ideally at each competition so you don't leave any points that you might score. My guess is that the rain at the last two events has kept the number of drivers lower, so getting into June and the summer should see more folks coming out. Another bonus starting in June is that the NY Region will be driving at the Nassau Coliseum, so that should be closer to more competitors and bring out a bigger field. We've had a different winner at each event, so that has spread the points out a bit. My guess is that there are plenty of drivers that could grab a lot of points and win the class or take a top spot, since there is plenty of driving still coming up! For what it's worth, the top four spots are taken up by rear wheel drive cars (Miata, Scion FRS, Subaru BRZ), and then we get into some front wheel drive and all wheel drive cars. The Street Touring Class certainly has it all, and also allows a reasonable amount of modifications to stock. Speaking of front wheel drive, several of us are in the new Street Touring Hot Hatch or STH class that the SCCA just created this year. I'll be interested to see how the FIAT does in this class-within-a-class up against the Ford Fiesta ST, Focus ST, Honda Civic, VW Beetle, etc.